Emeritus Professor Ted Parnall (right) talks with faculty from private universities in Kabul, Afghanistan. For fifty years, Emeritus Professor Ted Parnall ('67) has travelled worldwide to advance legal education and legal systems in developing countries. He has spent most of the time in Southeast Asia, Liberia, Laos, Afghanistan and East Africa and has an international reputation for his expertise and respect, his vision and his ability to get along with people. "There is no easy way to develop a fair, rule-oriented society. It takes time and the efforts of many people-whether in Kabul, Albuquerque or Washington DC. And it comes by inches, not yards. Unfortunately, there is no easy way, and it requires constant efforts, and it is always a fragile work in progress," says Parnall. "If I have learned anything from the past 50 years, it is that we should never take the Rule of Law for granted and the best of our UNM law grads are doing the daily chores that help protect it," he adds. To read articles about Parnall’s various travels and missions abroad, see the News section of his webpage. Parnall spent part of December, 2016 working in Kabul, Afghanistan with a United States Agency for International Development (USAID) Project. 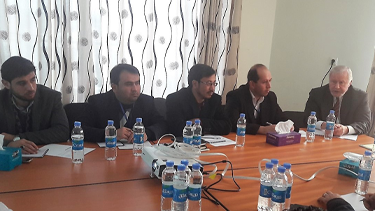 Checchi and Company Consulting, Inc. (Checchi) is implementing USAID’s "Assistance for the Development of Afghan Legal Access and Transparency" (ADALAT) Project, and engaged him to serve as its expatriate legal education specialist. While ADALAT’s general goal is to improve citizen access to justice services based on Afghan law, part of its activity is intended to support private university law faculties in strengthening their teaching methods and the teaching of practical lawyering skills (including increased integration of the clinical legal education method into the curriculum). During his assignment he met with legal educators and members of the international donor community who have been active in supporting law development in Afghanistan. Parnall has been involved in Afghan law development projects since 2007, and this was his seventh visit to the country. Most of his work has been in cooperation with Checchi, but he has also worked with the University of Washington School of Law’s Asian Law Center on an earlier visit. Parnall plans to continue his work with ADALAT, taking periodic trips to Afghanistan during the remainder of the Project. While security issues are an ongoing concern, he has a deep respect for Afghanistan’s people, and has close ties with many law professors who are at the epicenter of that country’s efforts to progress. This January, Parnall will also be working on legal education in Liberia. He will make a short term visit for USAID/Liberia’s Legal Professional Development and Anti-Corruption Project (LPAC). He is no stranger to that country, as he was the founding Chief of Party for the LPAC Project in 2015; he also began his teaching career in Liberia fifty years ago with a Ford Foundation project at the Louis Arthur Grimes School of Law shortly after taking his last law school exam in January 1967. Parnall grew up in Albuquerque’s South Valley, and attended Atrisco School and Ernie Pyle before graduating from Rio Grande High School. After his undergraduate degree from the University of Michigan, and a law degree from UNM, he worked for the Paul Weiss Rifkind Wharton and Garrison law firm in New York City. He joined UNM Law faculty in 1970 and was Dean from 1986-91. He is the only UNM law alumnus to serve as both a professor and dean of the School of Law. While he spent the bulk of his career as a professor of business-related law courses at the UNM School of Law, he has worked in law development projects in many countries, and has been a resident advisor in diverse places including Addis Ababa, Hanoi, Jakarta, Cairo, Tunis, Podgorica and others. He and his wife Kathy have three sons who are all lawyers, two with degrees from UNM law. Bert (JD 1997 – known for "Hurt? Call Bert") and Charles (JD 2007) have practices in Albuquerque, and David practices in San Francisco.